Is Webtrafficgeeks.org an Effective Source of Traffic? In the world of buying traffic, there are literally thousands of websites that sell, and orders of magnitude more who buy. There’s no shame in it, if you do it right. It’s not illegal. It’s not even unethical, again as long as you’re not doing it for an illegal purpose or to scam someone. We are one such site that provides traffic, but I’m not here to be self-promotional. Rather, I’d like to take a moment to talk about another in the industry. As you may have guessed from the title, I’m referring to WebTrafficGeeks. They have been growing more popular recently, so I thought I’d address what I know of them. Note: You’re not about to read a 2,000-word negative review about how you should ignore them and go with us. I’m going to attempt to provide an unbiased view. WTG – I’ll abbreviate it for the sake of brevity – boasts 1,880 satisfied customers as of the time of this writing, with just under 4,000 processed orders. They offer traffic in 130+ targeted niches and from over 40 countries, so you can control the traffic you get on a deep level. Ordering is a simple process. Pick a niche and a country, pick a volume level, submit the order, and wait for it to come in. They promise delivery within 24 hours. They do have a 100% money back guarantee, and a warning on their homepage. 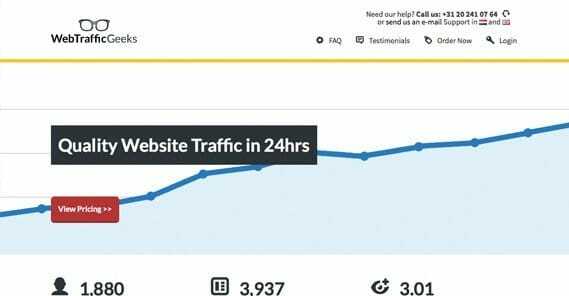 While they say their traffic is AdSense safe, they also say that they have seen large volumes of traffic – such as what they deliver – earning penalties for AdSense accounts. They recommend using their service in moderation or not at all, for AdSense-enabled websites. 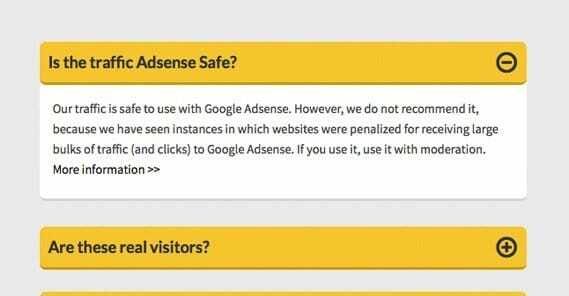 This is a good sign; many of the worst fake traffic providers will bend over backwards to claim their traffic is AdSense safe and that you should buy $1,000 worth immediately. They also claim that their traffic is 100% real, targeted, legitimate traffic. No bots, no PPC traffic, and no incentivized traffic included. As for how true that claim is, there’s no way for me to tell without access to their system, which I obviously don’t have. Interestingly, they are a global and international group focusing on many clients outside of the United States. This puts them in a unique position where they don’t have to worry about many of the restrictions, filters, and penalties that come with selling traffic to primarily US businesses. It also means they are well positioned to sell international traffic from one non-US country to another. They themselves are based in the Netherlands. What about their pricing? Their cheapest plan is 10,000 visitors, in up to three niches and countries, for $70. This scales up to 220,000, in the same limit of three niches and countries, for $750. They have a monthly subscription model for a 5% discount, or the option for a one-time trial. They have a fairly standard list of niches, ranging from advertising and dating to politics and religion. They also have a range of adult niches, if you’re looking to buy traffic to sites that host adult videos, pictures, casinos, or products, among others. You can see the list of niches and countries on their purchase page. One good thing going for them is the ability to spread out the traffic you buy. You can choose to have it delivered in as little as one day or as many as 30. This is very good, because if your site gets 3,000 hits daily, you don’t want to make a purchase of 50,000 to be delivered all at once. The unnatural spike is hugely detrimental. Spreading out the traffic is a much better plan. They accept payment in a number of ways, including traditional global credit cards, a few international options like Sofort banking and Giro Pay, or bitcoin. This gives any client plenty of options. Doing some digging, both on their site and off, reveals some more details. For one thing, I’m not a fan of some of their website copy. Some of it is stilted English that leaves a bad impression in my mind, but it’s at least higher quality than what you might get from a low-tier content mill or cheap foreign ESL copywriter. I chalk this up to the differences between Dutch and English. Even fluent bilinguals make mistakes. One trick I like to use in investigations is checking into the user profiles they provide. Copy a picture from a site’s team page and run a Google reverse image search. Where does that picture show up? In this case, the pictures they provide all show up in the same few places, which is a sign of legitimacy. There’s no instance of the same picture being used as the face of six different businesses, under different names, in different locations, which would indicate them using stock photography. So far so good. Poking into their web hosting and domain registration reveals that they are hosted by Digital Ocean, which is a highly-reviewed and legitimate web host based in Europe, local to the Netherlands, which makes sense. 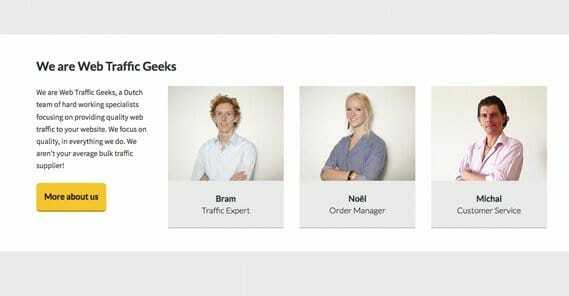 As for their domain, it is registered in the Netherlands – again a good sign – by Bram van der Veer. Looking him up identifies him correctly as the guy in their team photo, putting the final nail in the coffin of suspicion. They’ve only had the domain for a year, so they have plenty of room to potentially grow. The one little detail that bugs me is that, on his LinkedIn page, he lists himself as the owner of VoucherCode.nl, which he lists on his homepage as one of his clients for WTG. A little disingenuous, but not enough to overturn the rest of the evidence pointing at their legitimacy. They have a Google+ account, but it has largely been left disused. They only have 16 people in their circles, their cover photo is a grainy screenshot of their homepage from back when they only had 800 customers, and they only have one public post. I’m not too surprised, though; G+ isn’t the best means of promoting a site like this. They have no other social media presence whatsoever. Taking a look at their traffic via Easycounter, you can see that they get a little over 11% of their traffic from India. This is traffic to their site, not the traffic they sell, just to be clear. In second place is Australia, and the USA is third. They have a few high quality backlinks, and no real PageRank rating because Google hasn’t been publicly updating that metric. So what do users have to say about them? I’ll be aggregating reviews and maybe including a few quotations here, but bear in mind it’s not personal experience on my part. I haven’t used their service myself. To begin, you can read all of the positive reviews on their site itself. They’re all over the map in terms of provided information and detail, but what else is new in this industry? I’m sure over time they will replace the worst with better testimonials. What I’m more interested in are the reviews from third party sites, where WTG isn’t in control of what is shown. One source of reviews in this industry tends to be black hat web forums, like Black Hat World. Indeed, they even have a BHW testimonial on their site. This speaks more to the general air of disapproval the industry as a whole faces than to the quality of the site in question, though. Let’s see what some BHW users have to say. So, as you can see, it’s a bit of a mixed bag. I’ve found that pretty much no matter what service you use or review online, you’ll find that some people have good experiences and some people have bad. It’s hard to say, for example, whether some of these people are incorrectly measuring their traffic, or if they’re getting bot traffic, or if they bought traffic from several services and don’t have a good idea of which is providing what. People make mistakes, and some people have a hard time conveying what they mean to say. In general, neutral reviews in aggregate seem to be the trend. There were also several questions asked of the reviewers, but no one came back to answer. Of course, it’s always possible that these are fake reviews. Only one of them has an actual account on the site. I’ll leave that to your judgment. Overall, reviews seem to be neutral everywhere I look. Some people have good experiences, some people have bad experiences, and neither outweighs the other. If you’re interested in using a service like WTG or any other traffic seller, remember that it’s a gray hat industry. There are legitimate sellers, and there are sellers hawking resold traffic, bot traffic, or untargeted traffic. It’s a very “buyer beware” atmosphere, and you often have little recourse if you don’t like the traffic you get. Here are some tips you can follow. Start small. The best thing you can possibly do when buying traffic is take it nice and easy. Don’t go in for a subscription model right away, because you never know how tricky it will be to cancel if you want to stop payments. Don’t go in for a huge amount of traffic, because you don’t know what quality it will be and how it will take to your site. For WTG, you would want to go for their cheapest 10,000-hit package one-time only, and see what it gets you. If it works, and only if it works, should you consider getting more. Only once they have proven themselves should you consider subscribing. Read the terms and conditions. You want to make sure there aren’t any tricky terms about rights transfers or anything else. It’s entirely possible to fight legal terms in court if it comes down to it, but you don’t want to put yourself into that situation. Avoid using an ad program that bans you for excess bots. AdSense is the big one here, and like WTG says; they’re picky with the traffic they detect coming in to your site. If they don’t like it, even if it is more or less legitimate, they have the right to block you from the program at a moment’s notice. If you’re relying on an ad program to make your living, you might want to be very careful about what traffic you buy and from where. Make sure any money back guarantee is real. The shady sellers out there are liable to disappear when questioned or confronted. Their site works just fine, they’ll take new orders just fine, but the moment you go to request a money back claim, they clam up and won’t respond. Alternatively, some of them will respond, but will point out a clause in their terms for their guarantee that for some reason invalidates your order from the claim. Once again; buyer beware. Look up current reviews. I’ve quoted a few reviews in this post, but that’s just five or so out of who knows how many. They will swiftly grow out of date, and you never know what changes a company might undergo. Formerly high quality providers might sell their company to someone, only for that new owner to try to maximize profits by dropping traffic quality and customer service out the window. Always look up current information before you try to purchase. Only run one program at a time, so you can test the traffic it brings. Make sure you’re taking multiple data points before and after your order. You need detailed analytics to make sure you’re getting traffic as promised. If you buy 10,000 hits from Germany, you don’t want to receive 500 hits from Germany and 9,500 hits from India. If you’re buying 10,000 hits targeted to the automotive niche, you don’t want a ton of traffic referred to you from DIY knitting blogs. Don’t be shy about requesting that money back guarantee if the traffic doesn’t work for you. These sorts of businesses would rather have a customer satisfied with a refund than an angry customer leaving negative reviews. Don’t invest more than the minimum unless you can make a profit. I don’t care how targeted or how legitimate the traffic you receive is, if you’re not making money from it, it’s a loss. If you spend $70 on 10,000 hits and, in those 10,000 hits, make one sale for $30, you’re out $40. Maybe some of those people will come back, or maybe not. You’d have to do more testing to find out, and if you’re willing to test for two months and $400 in losses to see if they do, that’s your prerogative. I just recommend never buying traffic if you can’t successfully monetize it. If you’re careful, slow, methodical and low-volume with your testing, you can slip under the radar of programs like AdSense, and you can stay with the program while testing your traffic. It’s only when you have unnatural surges of poor traffic that you’re at high risk. After all of this, what’s my verdict about Web Traffic Geeks? Evidence points to their legitimacy, but there are – as always – a few concerning reviews. Start small, if you choose to order from them, and make sure the traffic they deliver is targeted, legitimate, and on time. Which Traffic Source Has The Best Converting Visitors? We bought some of their traffic for http://webhost.pro but never got a conversion. At most I would only do it to boost Alexa. I tried their smallest 10000 to start, and it was authentic traffic from what I can tell. I sent them to a landing page created specifically for this test. I did not get a single conversion, but I got alot of interactions from the visitors. Bounce rate averaged 30-33. But most importantly, they were all over the site. Which helps my stats all over.. 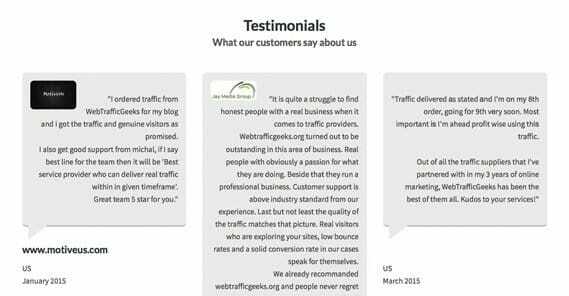 I have purchased 3 other webtraffic sources – and this was the only one that came with a very low advertising bounce rate and such an indepth customer interaction. No two visits ever looked the same. I upped my purchase to 25000 to see if that differed in any way and subscribed. Hello, we tested them. They are a SCAM. The traffic is bot traffic only. You can easily identify this by screenrecording your visitors. The bot traffic can also easily be spotted using GoogleAnalytics. It’s clicking on ANY link on your site and then doing nothing.